Soapstone is a naturally quarried metamorphic rock with a soft, or soapy, feel. Soapstone is beautiful, durable and naturally non-porous. Chemically inert, the stone is not harmed by lemon juice and other acids. Bacteria resistant and not impacted by cleaners that harm other natural stone surfaces, soapstone is often found in laboratories and food preparation areas. A dense rock, soapstone can withstand high heat without damage. 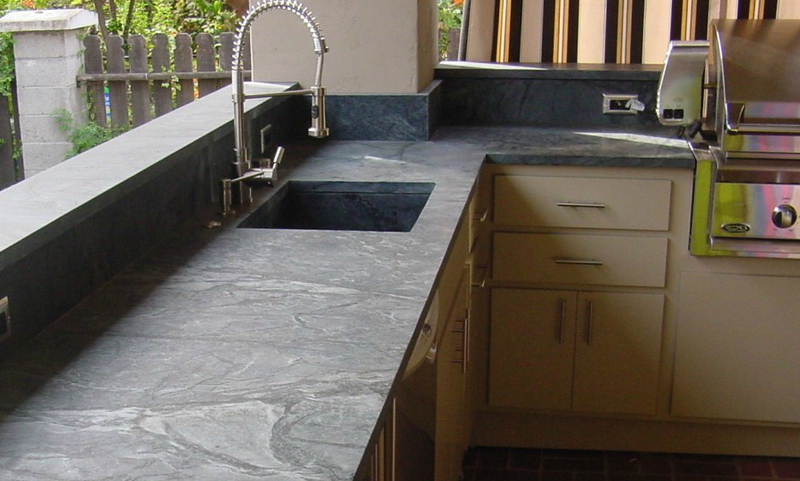 WHY SHOULD I CHOOSE SOAPSTONE FOR MY COUNTERS? The stone is available in a range of textures with gray shades, some with blue or green undertones. Since no two slabs are alike, soapstone offers a one-of-a-kind look. Soapstone is ideal for environments that demand durability such as outdoor kitchens.